Home Uncategorized HS2 – Will it be big enough and fast enough? The UK media has today exploded with coverage on the publication of the Commons Transport Committee’s consultation on High Speed Two (HS2), which is broadly supportive of the idea. HS2 is a planned new rail line between London and cities in the Midlands, the North and Scotland. Work on the £32 billion project will start in 2017, with the rail line opening between London and Leeds in 2033. Needless to say the Government’s plans are contentious, particularly with people whose peaceful villages are going to have shiny new rail line built through them. Some of the angles being taken verge on silly. Sky News’ desire to explain to people what a Nimby and a Luddite is is quite strange. At least it appears towards the end of the story. Not that there isn’t enough to write about. For example most reports about the Select Committee report miss what the Select Committee claims could turn out to be the biggest challenge to the project – whether it will be big enough and fast enough. Despite assurances from HS2 Ltd, the company set up to design and build the new railway line, many witnesses expressed scepticism to the select committee that the proposed line would be capable of running 18 trains an hour at 225mph. No high speed route in the world operates more than 13 trains an hour currently, the Japanese run 12 and the French are to start doing 13 an hour in December. These points were raised to the committee by ERTMS menu Pierre Messulam. Signalling is also tied to the issue of top speed of the trains. To realise faster speeds above 125mph, more modern methods of signalling need to be introduced to the network. 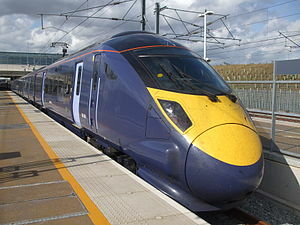 225 mph is significantly faster than current high speed trains, the Hitachi Class 395, the newest and most advanced train used in the UK, has a top speed of 140 km/h. The Select Committee confusingly identifies these factors as both a risk to the business case and a then says perhaps the plans should build in the potential to increase capacity more in the future. But just how fast could a high speed train go in 20 years’ time? Do we need to rush everywhere at 250mph? Will signalling technology limit what is possible?